Take an active management approach with liquid alternatives to increase R.O.I. Take advantage of inefficiencies in the market by investing in alternative assets. Hedge fund and private equity investment diversifies your portfolio and helps shield you from market volatility, allowing your more passive assets to work the long game. 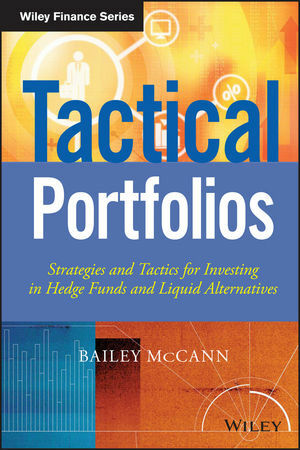 In Tactical Portfolios: Strategies and Tactics for Investing in Hedge Funds and Liquid Alternatives, author Bailey McCann guides you through the principles of hedge fund investment and the associated philosophies of risk management strategies. McCann's background in reporting and analyzing government policy and regulatory issues positions her as a valuable source of strategic investment advice. As Senior Editor of Opalesque's Alternative Market Briefing, her take on the market is read by every one of the top 100 hedge fund managers on a daily basis. In Tactical Portfolios: Strategies and Tactics for Investing in Hedge Funds and Liquid Alternatives, McCann goes in-depth on important topics. If your passive approach has failed to produce the desired results, liquid alternative investment may be the answer. While long/short will always be around, external forces can change its impact on your portfolio and it may be time to expand your investment arsenal. Tactical Portfolios: Strategies and Tactics for Investing in Hedge Funds and Liquid Alternatives will help you get the most out of any market. BAILEY McCANN is the U.S.-based Senior News Editor at Opalesque and an analyst who focuses on alternative investing. Prior to her work with Opalesque, she provided research and media intelligence for members of Congressional and White House offices, government contractors, and Fortune 500 companies.